ABIN185555 (3µg/ml) staining of paraffin embedded Human Kidney. Microwaved antigen retrieval with Tris/EDTA buffer pH9, HRP-staining. Specificité This antibody is expected to recognise many reported isoforms. Immunogène Peptide with sequence C-KKRIDEDDFADEE, from the C Terminus of the protein sequence according to NP_783195.2, NP_006522.2. DS WB Results: Approx 85-90 kDa band observed in lysates of cell lines HepG2 and NIH3T3 and in Human Kidney lysates (calculated MW of 85.3 kDa according to Human NP_001340507.1 and 90.4 kDa according to NP_001340498.1, and 93.1 kDa according to Mouse NP_033402.2 93. and 89.2 kDa according to XP_006518873.1). Recommended concentration: 0.3-1 μg/ul. Primary incubation 1 hour at room temperature. 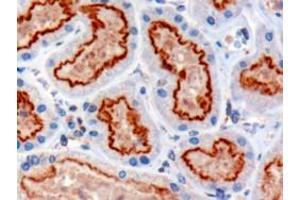 DS IHC Results: In paraffin embedded Human Kidney shows staining of the brush border in PCT. Recommended concentration: 3 μg/mL. Immunofluorescence: Strong expression of the protein seen within the cytoplasm of HepG2 cells. Recommended concentration: 10μg/ml. This antibody has been successfully used in IF on Mouse Olfactory and Respiratory Epithelium cells as described in the following paper: Miyoshi et al, FASEB J. 2009 Oct,23(10):3289-97, PMID: 19470799. Flow Cytometry: Flow cytometric analysis of HepG2 cells. Recommended concentration: 10ug/ml.